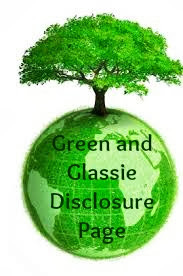 Green and Glassie: Every wonder what the inside of a truck camper looks like? Every wonder what the inside of a truck camper looks like? We recently purchased a Truck Camper for our Dually Pick Up Truck. We wanted a camper that fit on the back of the truck because it makes traveling and camping very easy. We purchased the Palomino Backback Model HS-8801. 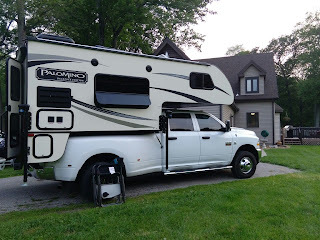 When we started camping in our camper - I was amazed at how many people thought that the truck campers had very little room and that they were not equipped with all the amenities as larger campers. I agree the truck campers are compact and I would recommend that the maximum number of people for a truck camper is two. Which is perfect for my hubby and I.
flat screen TV with cable and satellite connectors, stereo inside and out, good size closet space and storage, queen size bed, good size compact fridge, AC, heat, a outside shower for use to clean items and great for cleaning off the dog, power awning over the door, and a power awning along the entire side of the camper. Our camper is also equipped with power lifters that will automatically lift the camper off of our truck. Everything that is movable is powered. Here is a pic of the inside of our camper. As you can see - plenty of room for two. We enjoy the outside and spend the majority of our time outside while camping. We had a back door awning and also a side awning added to our camper. We love to sit and watch nature and people. Here is a pic of our camper during our last camping trip. The awning makes a nice area to sit under and relax. We also added a chair rack to our ladder and a hitch cargo carrier to our truck hitch. They rack and cargo carrier give us room to travel with our chairs, generator, and tote for grill and other items. We have owned a Forest River Camper for over 14 years - we have never had any trouble with it. So when it came time to purchase a truck camper - we knew the brand we wanted. Palomino RV is a subsidiary of Forest River. A company you can trust for quality products. 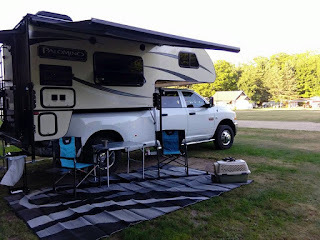 We purchased our camper from Kramer's Kampers in Zion, Il. Zion is north of Chicago along Lake Michigan. Everyone at Kramer's Kampers is friendly and very helpful...I highly recommend them as the place to purchase a camper if you live in SE Wisconsin or NE Illinois. Twenty days till we head to Yellowstone for two weeks! Make sure to stop back to read about our trip. 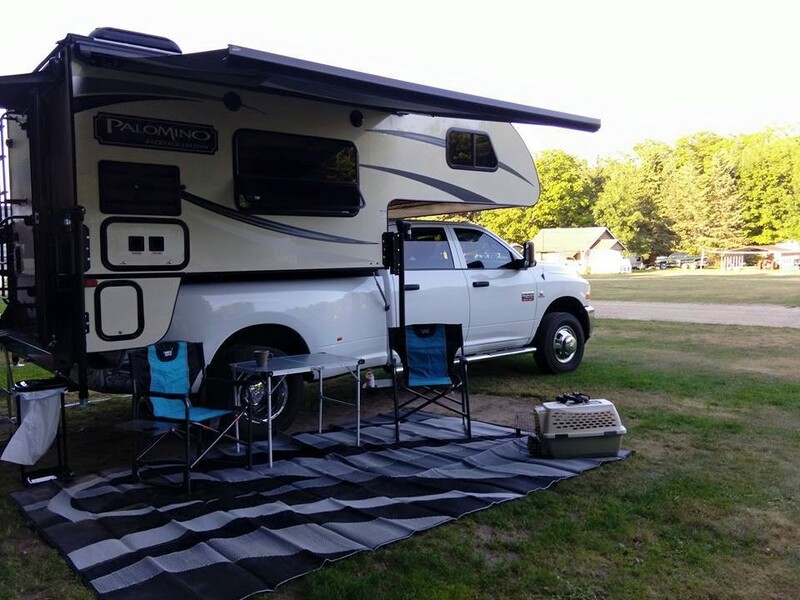 Were you surprised at the amenities a truck camper has to offer? We would need something much bigger for our clan but that unit is perfect for just the hubby and I! Storage is the only thing hindering is for purchasing a camper. A trip to Yellowstone is on our family bucket list! I think this would be the way to do it! Everything you need is with you and I think a smaller indoor space would encourage us to do even more outdoors when we're traveling and camping! I did not realize how homey and well-equipped these campers are. They're so nice! I've been wanting to try one since we went camping in June! Looks like a great way to travel! I would LOVE to get a camper and travel the US with my family. It would be wonderful hands on homeschooling that my kids could not get out of a book..
That sounds really nice. I would definitely be down for a family trip with a nice camper. I think those are cool. I've been in the ones you drive and the ones you tow, but never this one. Very fun! I have seen some that are small. Yours does have a lot more room. I really like it. It has more space inside than I expected. This is the way I would like to camp. It's amazing just how much space is actually in one of those campers. Looks very cozy! I have been trying to talk my Hubs into getting a camper. He just won't budge though. Maybe one day he will see things my way. Love yours! We are waiting to get one of these and this one is a sweet looking RV. Haave a great trip! OH wow those look pretty nice. I was just telling the hubs i want a travel trailer. You know I HAVE wondered what the inside of a camper looks like and would have never imagined it would be so nice and spacious! It looks like a mini house. What a great way to travel. I would LOVE to get a camper and travel the US. I'd actually like to do that by myself for a while and then MAYBE include my family after I've had enough quiet time ;-)! Wow how neat! My hubby really wants one of these trucks! We've had an assortment of campers over the years. Yours is beautiful. It's definitely a wonderful alternative to pitching a tent. I know you'll have a wonderful vacation next month with all the conveniences that make you feel at home no matter where you go. If I ever got a camper, it would be a truck camper. They seem like the way to go if you love camping! These always fascinate me. haha. There's so much in them and everyone whom I know that owns one, absolutely loves them. What a great camper! My parents have a pickup camper and took our two 11 year old kids for a week this summer. They enjoyed their time away and it was a perfect way to travel for the four of them. It has more space than I thought. I would love to rent one for a summer trip next year. These kinds of recommendations are great. I always like a firsthand account. I have always wanted to travel in a camper. I love how it makes traveling easier and such a family friendly event. Maybe we can rent one next summer. I love how everything is right there when you need it. It also cool how much more advanced they have become over the years. It's almost like a real apartment now, lol. I have always wanted to stay in an RV! It would be so fun to go camping on the beach in this! Nice article for movement, lifttruck attachments for household goods moving or industrial goods shifting, we provide excellent shifting support at the affordable cost and packing process done very carefully with the genuine packing.